You've had quite an exciting life, haven't you? Sorry for high jacking the thread but it sounds so interesting. Would love to hear more. Target has Kambucha on sale 2 for $5. Here we are, approximately a month from when I started growing my kombucha scoby. And, with great pride, I present the "baby photos" of the scoby. As scobys go, this one is as pretty as they get. Those who love kombucha and the health benefits that it provides can now offer the appropriate congratulatory, "Ah, look how pretty it is!" I bottled the recent batch of kombucha tonight and put it in the fridge, tasting it first. It was delicious. 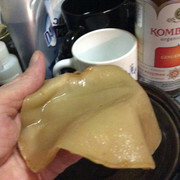 I grew this scoby straight from the store-bought GT kombucha mixed with my own brew of green tea and organic sugar. I didn't order anything through the mail. ...'just saying', so that others know it can be done. Yes, scobys look basically "gross". They have a 'face that only a mother could love'. Well, I'm starting over. 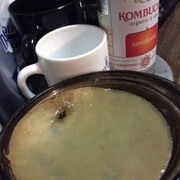 Some enterprizing gnats found my kombucha and laid claim to it. Previously I'd made a delicious brew,...actually it was even better than the store-bought brand that I'd cloned for the scoby (mushroom). I'd used Arabic green tea and organic sugar. But I'll be throwing out this recent batch along with the scoby. I don't have a 'back up' scoby, so I'll be starting over with store-bought kombucha,...hoping it will do as well this second time as it did the first. Also, this time I will think 'smaller'. Instead of the 32 ounce pyrex measuring cup, I'll use a 24 ounce pickle jar. I found this helpful online article on the problem of gnats, and I include it here as a cautionary tale. stored covered in the refrigerator or again keep several jars going at once." And here's a short video on how to make a fruit fly trap---sooo simple. I'm still drinking kombucha. I especially like pineapple kombucha. But I stopped making it myself at home because of the gnat problem. My kitchen is very small, without much counter space. So there's nowhere to put things 'away' and spray for the gnats. Finally, I had to give up on running my little one-person kombucha factory.